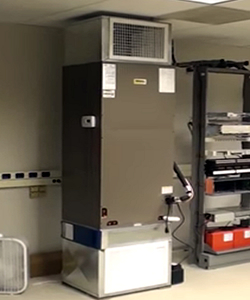 Determining Supplemental Air Conditioning tonnage needs for areas such as IT Rooms, Broadcast Edit Rooms, Control Rooms or General Office Space is determined by the heat loads generated by equipment, people and light required at each location. The following will help you determine calculating the heating and cooling thermal units (BTU) and how to convert that number into tons. 1. Measure the length and width of the room and convert that figure into BTU’s which is determined by multiplying the length and width. The measurement must be in meters, (1 foot equals .3048 meters). Multiply the area by 337 to figure out the area BTU. 2. If there are north or south-facing windows in the vicinity, calculate the BTU for each window by measuring the area of each. For north-facing windows, multiply the area by 165. For south-facing windows, multiply the area by 870. 3. Calculate the BTU of the number of people who work in the location. Multiply the occupants by 400 for the BTU. 4. All the equipment in the room needs to be measured for their BTU output. To determine the output, multiply the total wattage for every piece of the equipment by 3.412. Wattage can be found listed on the equipment or the equipment’s instruction manual. 5. Determine the lighting BTU by multiplying total wattage for the lighting by 4.25. 6. Add the figures from steps one through five. The result is your total heat load. Multiply this number by two to determine the amount of cooling required. 7. Convert your heating and cooling load to tons by dividing the BTUs by 12,000. The resulting figure is the HVAC tonnage. How do you know if you need supplemental cooling? When it comes to cooling a home, office, warehouse and more, be sure to know what options are available. 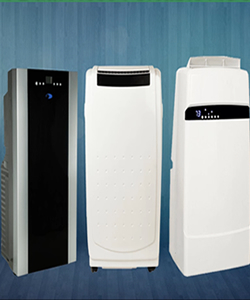 It is important to know what type of cooling options are available depending on one's individual needs, budget and ease of installation. In the warm summer months, it is essential that the indoor temperature be kept at a comfortable and pleasant level and that the hot elements of the outside are kept there. When deciding on whether or not you need supplemental cooling, ask yourself if there is already a cooling unit in place, and if so, is there an area or hot spot that still needs to be cooled down? Once it has been decided about which type of cooling unit to purchase, it is then important to look at the air conditioner capacity. Primary cooling. This type of cooling is the main one. It is used in places such as homes, offices, classrooms, trailers, computer rooms and more. This is when people don't have any air conditioning to begin with, or the air conditioning they do have turns off after hours and/or weekends. Supplemental cooling. This type of cooling many be needed if there is already air conditioning installed, but it is still hot in certain areas throughout the building. This type of cooling is needed if you don't have enough air conditioning in the space. Supplemental cooling will help because it will provide the extra push of cool air in areas such as homes, offices, classrooms, trailers, hospitals, computer rooms, and much more. Spot cooling. This type of cooling is perfect for areas that are hard to cool using traditional air conditioning. Spot cooling is used when you don't want to cool a very large area, but you just want to keep particular spots cooler than others. These particular areas are usually extremely large areas such as factories, warehouse, commercial garages, sporting events, and outdoor events. Spot cooling will actually cool a person, process or equipment that would normally not feel the cool area in the hot summer month. There are many different things to know when it comes time to choose supplemental cooling, if needed, and these guidelines are meant to help with the many different choices. The answers to many of your questions will help you on the way to the correct decision, as well as important tips and information to remember.